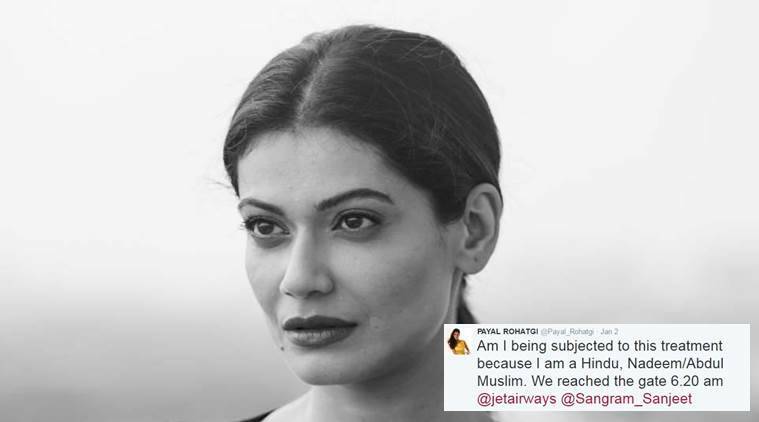 It’s common knowledge that one has to reach the airport at least one hour before flying but looks like Big Boss fame Payal Rohatgi had some trouble understanding it. Therefore, when she reached 30 minutes prior to her flight and was off loaded, she took to Facebook to rant against the Airlines. It would still have been okay if she would have stopped at that but the actor went on to give it a communal colour and said that officials named Abdul and Nadeem ‘who were Muslims’ didn’t allow her. In her live Facebook video, she said that she lost her cool because ‘she couldn’t do her yoga’ and the officials requested her to not abuse. “Muslim guys! I don’t know what was it? Was it a secularism act or was it just a normal act of being got up from the wrong side of the bed,” she said. She even took to Twitter to post the same. “Am I being subjected to this treatment because I am a Hindu, Nadeem/Abdul Muslim. We reached the gate 6.20 am,” she wrote.It’s obnoxious how two people who were just doing their job were targetted by the actor who is now being slammed on social media for the same reason. “This turd says “maybe the plane was going to crash”, calls to attention the attendants religion, complains she hasn’t done her yoga,” wrote a user.After all the slamming, the actor shared another video explaining herself.